DO I HAVE TO BE HOME TO RECEIVE THE BAG? No, just mark an “X” on your driveway with tape or chalk and we will gladly place the bag on top of the “X”. HOW DO I FILL MY BAG FOR WASTE PICK-UP? The bag can hold one metric tonne of material, safely. We do not accept payment on delivery because our driver is on a tight schedule. We accept Visa, MasterCard and American Express online and over the phone. We use a forklift that is 8 feet wide and cannot bring the bag to your backyard due to damage that the tires may cause to the lawn. We can drop the bag at any place the forklift can reach without causing any damage to your property. WHAT DO WE DO WITH THE BAG ONCE WE ARE FINISHED WITH IT? There are three options. You can keep the bag for personal use, you can return it for a $5 credit toward your next purchase, or you can fill it with domestic waste and we’ll pick it up for $119.95. WHERE CAN I RETURN THE BAG? You can return your empty bag to our yard located at 401 Bowes Rd., Concord, ON for a $5 credit toward your next purchase. Please visit reception for instructions. We will replace the product or refund your money, no questions asked. In recent years, the term “organic” has become fashionable and therefore widely used and “misused”. Unfortunately there are no public, commercial or government standards in place to define “organic soil” and it therefore becomes the buyer’s responsibility to do their due diligence. 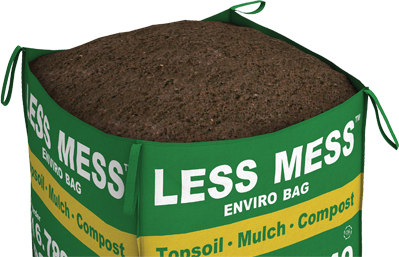 Less Mess packages and delivers products from Earthco Soil Mixtures – a leader in the soil industry. These products are derived from Earthco Soil Mixtures’ locations where environmental site assessments have been undertaken to ensure the property is not contaminated. You can be sure that the product you receive is of the highest possible quality; our materials come from natural sources and are reliable. While not “certified” organic, our materials have not come in contact with chemicals or contaminants. WHY SHOULD I TOP DRESS MY LAWN ? Top dressing your lawn is a great idea for several reasons. First, it allows you to level the surface on your lawn. Second, it enables de-thatching which allows nutrients to reach the grass’s root system quickly and easily. Choose a sunny but cool day to top dress. Less than 20°C is ideal. Rake your lawn thoroughly to remove all the dead grass. Apply no more than one inch of Less Mess Top Dressing Blend. Rake in Top Dressing Blend thoroughly until you can see the grass again. WHAT ARE FIVE EASY STEPS TO A HEALTHY LAWN? Remove all the dead grass from your lawn by raking it thoroughly. Core aerate the lawn (usually costs $40 dollars for a medium sized lawn). Two days later, spread no more than one inch of Top Dressing Blend over the lawn. Rake Top Dressing blend thoroughly into your lawn until you can see the grass again. Lastly, spread some grass seed in the areas that aren’t as full as you’d like.